Some cancer medications cost too much for too little benefit, suggests a study published last year in the British Medical Journal. The study indicates that many chemotherapeutic drugs are only shown to increase life expectancy in those with stage IV (metastatic) cancer by a few months. Yet these treatments can incur costs as high as six figures. This applies to medications that have been widely used for many years, as well as a number of recently developed, and often more expensive, chemotherapy drugs. Studies indicate that the number of deaths due to cancer have declined in the last few decades. However, this is largely due to developments leading to early detection and treatment. Many types of cancer are widely treatable in their early stages. Should a tumour be detected in its early stages it may be removed through surgery entirely. The risk of remission can be reduced through the use of radiotherapy, chemotherapy and, now, immunotherapy. Cancer becomes a much more threatening prospect once it is metastasized. Metastatic cancer is described as being the stage of cancer in which the initial tumour is no longer a solid mass. Instead cancerous cells from the initial tumour site break away, travelling through either the bloodstream or the lymph vessels to other locations in the body. In the bloodstream, these tumour cells have access to the entire body. Some may settle in other areas or organs of the body, forming new tumours. This presents further complications to the treatment, surgery may be an option to remove the initial tumour, but the location of new tumours is highly variable, capable of being almost anywhere in the body, and affecting any organ. Due to the process by which they move from the bloodstream, avoid immune detection and begin replicating again, the tumour cells may not be identical to those in the original tumour, further complicating treatment. 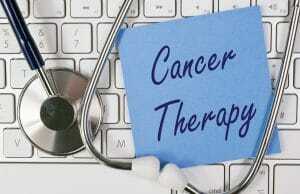 In metastatic cancer chemotherapy is the standard treatment. It is at this point that the chemotherapeutic drugs are utilised. The survival rate for those with metastatic cancer is usually very low, though varies depending on the initial cancer type. In metastatic breast cancer for example, the five year survival rate for stage four (metastatic) breast cancer is as low as 22 percent. By comparison, stage three (pre-metastatic) breast cancer has a survival rate of 72 percent. During the initial stages of cancer, stage two survival rate is 90 percent. On the other end of the spectrum for survival, stage 4 testicular cancer can show a survival rate as high as 80 percent. Though this can vary widely, and is largely dependent on where the cancer has spread. Despite the usage of these highly expensive chemotherapeutic drugs the survival rate may still be very low. Those in the advanced stages of cancer are often beyond the scope of medicine to expect a cure, and realistically the focus of treatment shifts to symptom management to extend life or to make the time left more comfortable. hers. Many “offered patients only marginal benefits, with no evidence that they improve survival or quality of life” says Dr. Vinay Prasad, assistant professor of medicine at the Oregon Health and Sciences University. Dr Prasad has written extensively on the Food and Drug Administration’s (FDA) approval process. According to Dr Prasad two thirds of recently approved chemotherapeutic drugs have no beneficial effects at all. The author of the BMJ study, Peter Wise, is equally critical. As a former consultant physician, Peter Wise believes it is inappropriate to advise a patient to be spending a six figure sum on a medication that may marginally extend life expectancy when they will “almost inevitably die” from the cancer. Patients are often said to have “unrealistic expectations” of the chemotherapy. Wise thinks that the patient may make an assumption that a medication this expensive would have a positive outcome. s not the only variable, to attribute the survival solely to a drug costing $72,000 is misleading. The study itself even attributes some of the improvements to more advanced imaging techniques, then dismisses this in favour of the medication.The study may be biased towards approving the expensive medications, as it is noted that a number of treatment methods were used. Some patients also received radiotherapy, though it is not noted whether these patients were the medicated group or the negative control group..
What is certain is that a large number of chemotherapeutic medications are being approved by the FDA, many without any evidence of an improval of survival rates at all. Some add an average of 2.1 months to life expectancy. John Conley, MD, former President of the American Society for Head and Neck Surgery suggests the FDA is lowering the efficacy bar, rolling out consecutive medications with marginal benefits, while doing so driving up the costs of cancer treatment to a concerning level. Peter Wise suggests that focus should be redirected from premature media hype over the latest in a series of marginally beneficial treatments to prevention and early stage detection, as well as treatments that have been shown to have considerable benefits. Immunotherapy for example, using drugs which provoke the immune system of the patient to attack tumour cells in the same manner it would attack invading bacteria or a virus. An accurate comparison would be to compare immunotherapy drugs to a vaccine, whereas chemotherapy uses chemicals to reduce growth and replication. This kind of treatment has shown to have a large degree of success in patients with metastatic cancer, though comes with associated risks. The body may attack healthy cells in the process, this has been documented to cause damage to organs, occasionally resulting in diseases such as diabetes. Immunotherapy drugs are a recent invention, and negative aspects such as this may in the future be limited. Using several drugs at once has also been shown to be a more successful treatment method, this is referred to as combination therapy. The concept behind the treatment is to avoid drug resistance in the cancer, which often results in a recurrence of the tumour. Often singular cells that survive the initial treatment, and the resultant favourable growth conditions due to absence of competing tumour cells, causes the cancer to return. By using several drugs in combination, this situation may be avoided. As the BMJ study mentions, the media is often on the lookout for huge breakthroughs, and will find one where none exist. Headlines using buzz words like “groundbreaking” and “miracle” do little to help this when in reality cancer is a long way from being cured. The efficacy bar needs to be raised, and both funding and attention need to be aimed at therapies producing results.